Last year turned out to be a very pivotal year for both Taseko and the copper sector. The year began with depressed copper pricing and a perception of a significant over-supply of copper that would put downward pressure on an already low copper price. There was very little optimism from most industry analysts and experts. While I can’t say that I was overly excited about the prospects for the year, I do know that the long-term price of copper did not decline and was still in the US$2.75 to US$3.00 per pound range. So for every year when the price of copper is US$2.25 per pound, there will be years where the long-term price will be exceeded. 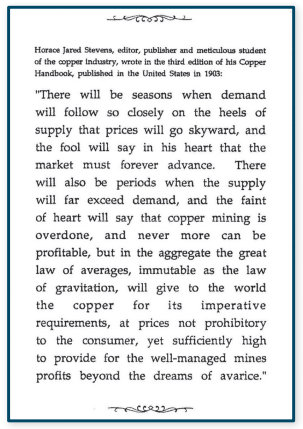 To the right is an excerpt from the Copper Handbook which was published in 1903 which sums up the copper market quite well. Even though this is over 100 years old, it continues to hold true and hangs in my office as a daily reminder of how things can rapidly change in the copper business. In the first three quarters of the year, copper pricing drifted between US$1.95 per pound and US$2.25 per pound. At these price levels very few copper producers generate a profit and many are even cash flow negative. We worked diligently at Gibraltar to reduce our cash costs in the face of a weak copper price. Although our efforts were hampered by lower copper grades in the first half of the year, with a concerted effort by all employees, we have steadily reduced our cost per pound every quarter since the first quarter 2016. Our fourth quarter last year brought the long-awaited higher grade ore which increased copper production and decreased cash costs per pound. We knew that even with copper prices at a US$2.25 per pound level, Gibraltar would generate significant cash flow. What we didn’t anticipate was the very sudden copper price increase which took place in November. The combination of improved operating performance and the higher pricing led to great financial results in the quarter, generating $50 million of cash flow. So far in 2017, we continue to benefit from higher grades at Gibraltar and a strong copper price. The first quarter of the 2017 was another great one. Production was again above 40 million pounds and costs were further reduced to a very low US$1.33 per pound. While production levels will fluctuate modestly from quarter to quarter, we anticipate a full year of better than average production. While we are unable to predict where the copper price will be in a year from now, we remain optimistic that we are now in the early stages of an extended period with an under-supplied copper market. The majority of new mines and expansions which pushed the market into a surplus in 2012-2015 are now operating and integrated into today’s supply and demand fundamentals. Improving demand growth has absorbed the new production and supply disruptions already this year have driven the market into a deficit. There remains considerate political risk in many South American, African and Asian copper producing countries which could further exacerbate the copper deficit in the short and medium-term. We believe this, in turn, will cause upward pricing pressure in the months ahead. We continued to advance our development projects in 2016, most notably Florence. Progress was made with permitting and the final two permits required to construct and operate the Production Test Facility were received in the second half of the year. Both permits are currently going through an appeal process which we expect to be resolved later this year. In addition to the permitting work, we announced the results of a two-year in-series pressurized cell leach test. This test was designed to more closely replicate in-situ leaching conditions and provide information on a larger scale than previous leach tests. The results verified and greatly increased the confidence in the metallurgical input data used to simulate the performance of the project once it reaches production. In parallel with the leach test, an optimization of the project well field development sequence was performed and then the entire project was re-simulated and re-costed using updated inputs including the verified leach performance data. Based on the new data, the net present value of the project increased to US$920 million (pre-tax, 7.5% discount rate) with a 44% internal rate of return and a 2.3 year payback. At Taseko, success is dependent on our employees and their health and safety. In this area, our diligence has paid off with a continued strong health and safety track record in 2016. Unfortunately, our extended streak of more than 3.5 million worker hours without a Lost Time Incident (LTI) came to an end in 2016. But even though our safety record in 2016 took a minor setback, Gibraltar was the recipient of the John Ash Safety Award. The award goes to the mining operating in British Columbia with the lowest injuryfrequency rate that has worked at least one million hours during the year. Congratulations to all the employees on this notable achievement. I would like to again thank all of our stakeholders for your support over the past year. We have held ourselves to a long-term strategy for the past ten years, one which I believe will reward all of us as the scarcity of copper supply impacts global copper markets in the years to come.